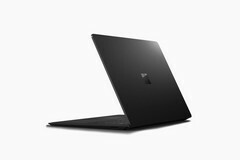 With Microsoft’s Surface event locked in for October 2, the rumor mill has started to kick in and the first points to a new Surface Laptop 2 in a new black color. This is said to replace the current Graphite Gold in the line up while the Platinum, Burgundy and Cobalt Blue color options will continue. The next-generation Surface Book is also tipped to pick up the new color option. The Surface Laptop 2 will continue with the same fundamental design and overall dimensions. This includes, sadly, persisting without a USB-C port with Microsoft looking as though it will skip it for at least another 12 months. It will, however, get a refresh to Intel’s 8th gen silicon that should help to give it a decent boost in performance and battery life. RAM and storage options are also expected to remain at up to 16 GB and 1 TB, respectively. One other feature that is expected to continue on the Surface Laptop 2 is Microsoft’s penchant for covering its keyboard surrounds with Alcantara fabric. Alcantara is widely used in car interiors and luxury products, but like any fabric, is prone to getting discolored if not regularly cleaned. There are plenty of images on the web of the Platinum colored models looking pretty putrid. The new black color should help mask this.